Fabricating jobs often require the bending of parts. Typically, fabricators use press brakes for these operations. Sometimes, using a press brake seems like overkill, especially on smaller parts, and adds a secondary operation and cost to a job. Bending parts by hand could help lower manufacturing costs and speed time to delivery. EasyBend™ is a tool that creates bend lines to make hand bending operations easy and convenient. EasyBend is ideal for intricate assemblies where conventional press brake forming techniques are inconvenient. EasyBend employs a linear V-line to create a stencil in the sheet metal. The tool penetrates the sheet metal, creating a crisp bend line, enabling it to be bent by hand. The angle of the stencil point is related to the angle of the desired form, which must be specified when ordered. 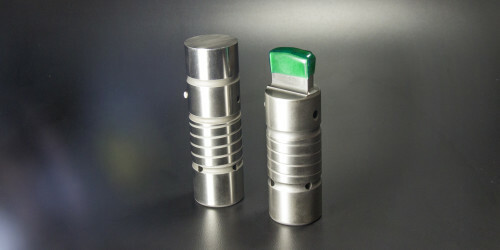 The actual depth of penetration is dependent on the ductility and thickness of the work piece. The continuous nature of the design allows the length of the bend-line to be a maximum suggested length of 12 inches (300mm). EasyBend opens up a lot of possibilities. One such idea is to use it to make tabs that can lock two parts together (Figure 3), which can be particularly useful in field installations or repair applications in various industries. You can also use EasyBend to perform multiple and decorative bends. Figure 4 shows a display in Mate’s Customer Solution Center that used EasyBend and other forming applications such as louvers.